Merced has played a role, for the past 125 years, as a sleepy agricultural and transportation center and a travel gateway to Yosemite National Park. But in 2005, the long-awaited University of California Merced campus was finally opened, which should over time greatly influence its role and character and bring positive growth. Aside from the University and its 2100-acre campus northeast of town, Merced is a typical Central Valley town, with a pleasant if somewhat mundane character. Retail and residential growth are well-planned and attractive. The COL Index and median home prices are extreme, especially given local incomes. Those willing to pay these prices are clearly betting on the future, and if Merced grows up to be another Davis, home of the University of California campus of that name and an excellent college town example, things should work out well. The immediate area is level and mainly agricultural. Just to the east, the Sierra Nevada foothills rise into an oak-studded grassland with mountains approaching 13,500 feet. Coastal mountains rise to the west to 4,000 feet, providing a dramatic landscape on all but the most dusty or hazy valley days. Climate is typical for the Central Valley- hot, dry summers and mild winters with frequent valley fog and about 90% of the year’s annual rain. The median home price in Livingston is $245,700. Browse Homes in this Range. 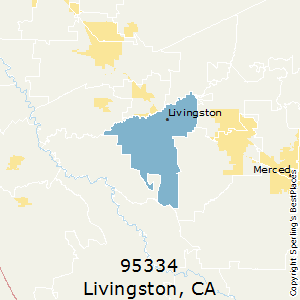 Compare Livingston (zip 95334), California to any other place in the USA.